When you see a puppy your heart melts. Your mind is overcome with images and thoughts of how cute, cuddly, and innocent puppies are. I'm that type of person. When I see a puppy, I immediately want it. In the summer of 2009 I was lucky enough to actually get a puppy. 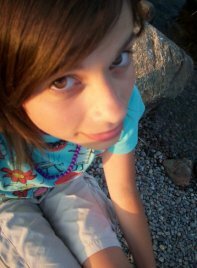 The summer of 2009 was the best summer of my life. A few days before summer vacation I had asked my dad if I could get a puppy since I was moving in with him. After a few days of thinking he finally agreed. I had my heart set on getting a yellow lab. I thought they were the cutest puppies ever. I searched online for people selling puppies and I finally came across one ad. I read the ad carefully. It said that there were 9 puppies available on June 21st, golden retriever cross yellow lab breed. I told my dad and we drove 3 hours from our city to visit the puppies. When we arrived the puppies were still very small. They had just learned to walk. I was so amazed. I couldn't believe that I'd be getting one of the puppies in the next couple weeks. Before we left my dad confirmed that we'd be getting one of their puppies. We decided on getting a male. I decided on "Marley" for a name, after the dog in the movie Marley and Me. Although I hadn't chosen which dog I was getting, I thought the name Marley would suit any dog, and now that I think about it, it really did. The night before June 21st I couldn't sleep. I had asked my best friend to join our three hour journey the next day to pick up Marley. She agreed, and she couldn't sleep that night either. Morning finally came and we departed. We got into my dad's car and started to drive. Three hours later I started to recognize where we were. We drove down the road we had driven down just a few weeks earlier to see the puppies. I was shaking, I was so excited. We pulled into the dirt driveway and got out of the car. The mother of the puppies came running up to us. I patted her on the head, then looked over to see two puppies jumping and barking behind a fence. I gasped. I couldn't believe how big the puppies had grown. The owner of the puppies came out and let the puppies out. She picked up Marley and showed him to me. I still couldn't believe that he would be mine. I was so excited. He was the most adorable thing ever. Thirty minutes later we were back in the car, with Marley lying on my lap. The first few weeks were hard. I was slowly learning Marley's patterns. Go to bed at nine pm. Wake up at three am. Go back to sleep. Wake up again at six am, then go back to sleep. He was definitely a handful. I also learned the odd habits he had. When I would give him water he would drink some, then when he'd had enough he would put his paws in his dish and splash the water all over. He was quite the character. Marley grew right before my eyes. One day he was a small little thing, the next, he was twice the size. I can't imagine how big he is right now. In August, I had a lot of personal, family problems that got in the way of everything. Since I was living with my dad I had a lot of stress about going to a new school and everything else. The stress definitely overcame me to the point where I wanted to move back to my mom's. I spoke to my mom and asked her if I could bring the puppy with me. She said no since we already had a dog there. I was upset. I didn't know what to do. That month I was also supposed to go on a one week trip to New Brunswick. A few days before my trip I went to a friend of a friend's cottage. They all knew I had a puppy. The night was going well until someone asked if I was giving my dog away. I honestly had been thinking about that even though it killed me. I didn't know what to say. It was a nice family that was asking, and I knew they'd take care of Marley. They said they'd offer me money, but it wasn't about money. I thought long and hard. I felt pressured to give him away. I thought they'd give him a much better life than me anyway. At the end of the night they won, and I said yes. They were getting my dog. A day before my trip we all arrived at my dad's so they could get the dog. I had to fight back tears the whole time. I walked into my house. Marley was sitting there. He ran up to me, all happy to see me. I smiled and stroked him, then went over to his pile of items and packed them up. After putting everything in his bin I kneeled down and looked at my dog. Tears were running down my face. "Don't forget about me, okay?" I said to him. He just looked at me. I stood up and guided him outside. I handed the bin of stuff to the family and watched them drive away with Marley. It was one of the hardest days of my life. By the time you're reading this it will be May. Marley turned one year old on April 26. The family I gave him to gave him away to another family, so now I have no chance of ever seeing him again. They renamed him Rex, or so I heard. I know it's just a dog, but once you get a dog you immediately bond with him and he becomes your best friend. Marley was my best friend. I miss him every day and I regret giving my best friend away. Giving Marley away was as painful as losing a real, human best friend. If you ever get a puppy always know he will become your best friend. He will be your best friend forever. People always form special bonds with animals, and I know how they feel now. I don't think I will ever forget Marley, the dog that made the summer of 2009 the best summer of my life.